There are multiple ways to play Fighting Fantasy, and there are multiple ways to enjoy it. Again, that is where modern-day minds are. Algorithmic thinking, computational thinking, is all about having multiple solutions to problems. Readers are invited to work their way through the books in different ways without being told ‘you are wrong’, and feeling like a failure. In schools, we often hear about children being told: you’re doing it the wrong way. There’s only one answer, so you’re either right or wrong. Because the books are a personal experience, you can make wrong choices but are encouraged to try again until you succeed. They make success a work-in-progress. When that success comes, the sense of accomplishment is even greater. Which suggests that Fighting Fantasy is good for its readers. Back in the day, Fighting Fantasy attracted huge amounts of criticism. Parents at the time – who, ironically, were worried when they saw their children immersed in our books – signed petitions requesting Penguin Books to ban Fighting Fantasy. The Evangelical Alliance published a guide warning that interacting with ghouls and demons was akin to devil worship! I was told that a woman in deepest suburbia phoned her local radio station to say that, having read one of my books, her son levitated. So, of course, kids were thinking: ‘Great, for £1.50, I can fly! But, over time, teachers found that Fighting Fantasy is great for reluctant readers and children with short attention spans. It gave these children a real sense of achievement because they were making decisions and winning through in the end. There were articles written about the danger of children becoming immersed in these books, as though that’s a problem. Imagination, and the exercise of it, should always be regarded as a good thing. Fighting Fantasy made thousands of children want to create their own stories and do their own drawings. 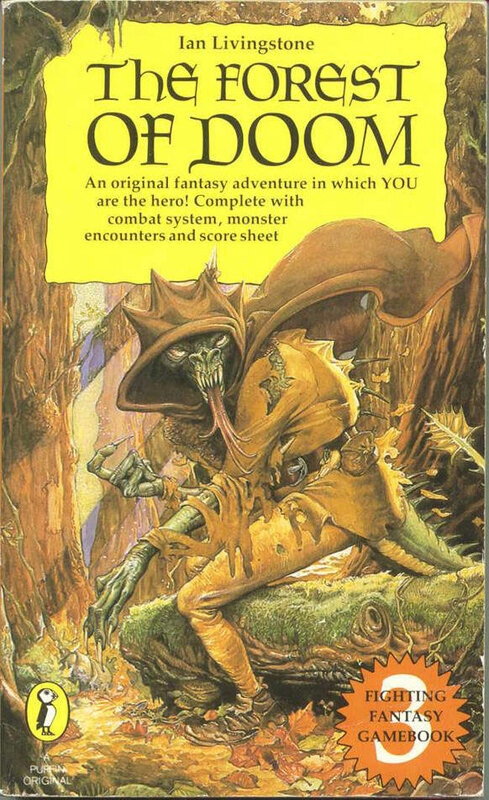 It was subsequently found that Fighting Fantasy, interactive literature, increased literacy by 17 per cent – because of that engagement and empowerment. Yet because they’re gamebooks, not traditional books, they’re somehow regarded as trivial. 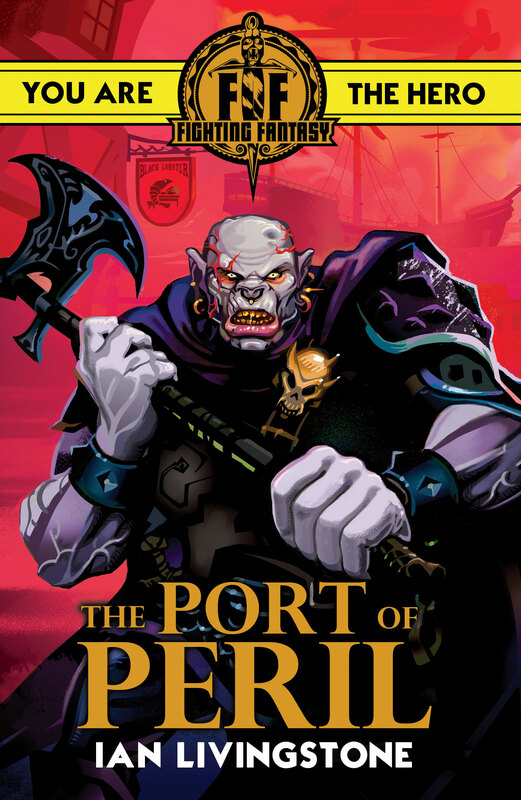 Who have you written The Port of Peril for? For children? Or for their parents? I’m sure I read somewhere that you’d wrestled with the problem when writing Blood of the Zombies for the 30th anniversary. And Blood of the Zombies did seem more adult, I thought. It was quite a dilemma. Am I writing it for 10-year-olds or for 40-year-olds masquerading as 10-year-olds? In the end, I did what I always had done – I wrote it for myself, hopefully appealing to fans young and old. Blood of the Zombies was present-day, so it required a different approach. But The Port of Peril is back to the original Fighting Fantasy setting of Allansia. I’m really pleased with how it’s turned out. The adventure begins in Chalice, where you find a discarded treasure map. You set off in search of the hidden treasure and, as events unfold, you learn of a terrible threat that hangs over Allansia. Your adventure will take you to Darkwood Forest and Port Blacksand where you will meet several well-known characters along the way. Ultimately you have to face the reincarnated Zanbar Bone who is back to wreak havoc. Hopefully, fans from the 80s will enjoy it. There’s lots of little Easter Eggs in there for them. When Steve Jackson and I came up with the concept for Fighting Fantasy, we made a decision not to write them specifically for children. We were Dungeons & Dragons players, and wanted to create an immersive role-playing experience, not an interactive fairy tale. We knew they would enjoy grisly adventures where they would face danger at every turn. So we wrote them for ourselves. It just so happened that, in the 1980s, the readers ended up being 10 to 12-year-old boys, in the main, but more and more girls began to enjoy them over time. I’d say that today’s audience is more between eight and 10-year-old boys and girls, which is great. But it’s always been self-indulgent – just writing them for myself. I’ve put as much effort as I can into The Port of Peril. In fact, it’s longer than most of the other books I’ve written. It’s pushing 60,000 words, so it’s going to be quite meaty. I don’t want to patronise readers or modify the language, thinking they’re a certain age. I always love it when parents say to me: ‘My child asked me what “sarcophagus” meant, and they got out the dictionary and looked it up!’ They’re keen to find out what these words mean. We’ve been talking about books and gamebooks – but, of course, Fighting Fantasy has been translated to other media. I’ve been playing The Warlock of Firetop Mountain on my computer, thanks to Tin Man Games’ adaptation. Other titles have been brought across to iOS and Android. What, if anything, makes the paper versions special? There’s been a resurgence of books in shops. Board games, as well. I’ve got a collection of 1,000 board games. I love the physicality of them. And the physical experience is what many people will remember from Fighting Fantasy. I call it the ‘five-fingered bookmark’ – when you see people with their fingers spread between the pages of a gamebook, so that they can retrace their steps. It’s very satisfying to be able to flick through a book, looking at the creatures and enjoying ‘peeking around the next corner’. The experience on computers and iPads is more visual but leaves less to the imagination. Gary Gygax, the co-creator of Dungeons & Dragons, once said that he preferred radio to television because the pictures are better. Don’t get me wrong. Tin Man and Nomad Games have developed incredible digital adaptations of Fighting Fantasy, most recently with Nomad’s Fighting Fantasy Legends. Computer games can add a lot more content than the original books and also allow the player to go back to previously visited locations when things might be different. They’ve taken the experience to a new medium, which is brilliant – it’s just a different experience to the books. As for the process of writing The Port of Peril, judging by your Twitter account, it seemed to happen quite quickly. You wrote it in a few months? I’d actually been thinking about it for over a year, and I wrote it in four months, putting in 12 hours a day, sometimes 7 days a week. The story changed a bit as I was writing, but the outline, the objectives and the protagonists had all been planned out in advance. I had it all mapped out, and took encouragement from Twitter to get on with writing it! Is that how you generally approach writing a Fighting Fantasy story? Yes, I start with an objective, a plan of where it’s going to take place, the main protagonist, an overarching storyline, and then it’s just a matter of writing it. The writing itself is a very iterative process, not least because you’re dealing with several branches of the story at once. There’s a lot of back and forth. You realise that you need a key at some point, so you have to go back and put one somewhere where people can find it. The main challenge is making sure that all the branches weave in and out of each other correctly. You don’t want people to get stuck in a loop, but you do want them to arrive at certain common points, for the sake of the story that you’re telling, and information you want them to have. Another consideration is the balancing, so that it’s not too hard or too easy. You’ve got to do the gameplay balancing, so that the monsters aren’t so tough that readers can’t get past them. You’ve got to make sure the economy is right, so there are enough gold coins, but not so many that readers can just buy their way through the adventure. It’s quite an involved process. At the same time, you’ve got to make sure that there’s a lot of story to enrich it. I’ve introduced a lot of non-player characters in The Port of Peril, so there’s a lot of dialogue between you and other characters to give a more powerful narrative to the whole experience. It’s not just a game, it really is a gamebook. It sounds like a heavy process. Are there some parts you enjoy more than others? I really enjoy, as I said earlier, luring people to their doom. It’s like sprinkling petals towards quicksand. I also enjoy creating monsters, and I love going back to the old places. It was great to return to Port Blacksand. Writing The Port of Peril was quite a gruelling task 35 years on, but I can’t – and wouldn’t want to – complain. I really enjoyed the whole process. I was lucky enough to turn my hobby of playing games into a career. Does mixing hobby and career end up detracting from the hobby? If you play a game or read a gamebook are you too busy peering behind the scenes to fully enjoy yourself? No, I’ve always enjoyed games for what they are. I’ve been running something called the Games Night Club since the 1980s with the same six people. Steve Jackson’s in it. So are Peter Molyneux and Clive Robert, along with two others who aren’t in the games industry. We keep a record of every game played, we have a scoring system, and then we award a trophy at the end of the year – the Pagoda Cup, named after the road I used to live on. There’s even a newsletter for the Club, which is now on issue #445. Not bad for a publication with a circulation of six! You mentioned Steve Jackson then, which is probably a good excuse to go back to the beginning of Fighting Fantasy. Well, Steve and I met at Altrincham Grammar School back in the 1960s. We were both playing games back then. He went to Keele University. I went to college in Manchester. And we kind of lost touch for a couple of years. But we met up again in London, and shared a flat with John Peake, another friend who was also from Altrincham Grammar. We all had pretty boring jobs, and we played board games as a hobby. At the beginning of 1975 we thought: wouldn’t it be great to turn our hobby into a business? John was an excellent craftsman, a civil engineer by profession, and he would take bread boards and turn them into solitaire boards. We made some Go boards and backgammon boards. I used to sell them to game shops. Steve would do all the admin, the invoicing, that stuff. This was the beginning of Games Workshop – we called it that because John’s bedroom was effectively a workshop. We decided to reach out to everyone we knew in games by publishing a newsletter called Owl & Weasel, and somehow a copy found its way on to the desk of Gary Gygax in Lake Geneva, Wisconsin. He’d just invented Dungeons & Dragons with Dave Arneson. Gary sent us a copy of D&D. John didn’t actually like it – he was much more traditional – whereas Steve and I became obsessed with it. We ordered six copies and, on that back of that order, we got an exclusive distribution agreement for three years for the whole of Europe. That really got us up and running. By 1980, Workshop was running Games Days, and that year one was held at the Royal Horticultural Hall. External companies had stands there, including Penguin Books. They were there with a book called Playing Politics. The editor, Geraldine Cooke, was fascinated – probably bemused – by what she saw. All these people so enthusiastic about playing D&D. 5,000 people completely immersed in the experience of roleplaying. It took them the best part of a year to finally agree. We got our contract and started writing The Warlock of Firetop Mountain, as it came to be, in 1981. There were also some umming and ahing about whether it should be a Puffin book or a Penguin book. Ultimately, it became Puffin. It was really down to Geraldine. She was such a great believer in the idea of an interactive book. Without her, I don’t think Fighting Fantasy would ever have been launched. During the year when Penguin Books were dithering about whether or not to commission us, we’d actually written to George Allen & Unwin, the publishers of The Lord of the Rings, suggesting interactive books where you are Gandalf or whoever. We got a very short rejection letter. We’re fortunate we did, in hindsight, because, otherwise, we’d have effectively been a work-for-hire for George Allen & Unwin, with no intellectual property ownership. Anyway, The Warlock of Firetop Mountain came out in August of 1982, with zero expectation from Penguin. Steve and I promoted it as much as we could through Games Workshop, but there was no real marketing budget. The book didn’t start selling very well at all. But then something happened. In certain parts of the country, somebody would buy a copy and tell their school friends, and that would go to the next local school, and it just started to take on a bit of an uptick in sales. Penguin ended up having to reprint about ten times in the first two months, each time a small number. One day, Geraldine came on the phone and said: ‘We want two more! You’ve done it! Well done!’ And then Steve wrote The Citadel of Chaos and I wrote The Forest of Doom, which came out in 1983. By 1984, things were going crazy. Deathtrap Dungeon came out in April of that year, probably one of the most famous Fighting Fantasy gamebooks. Normally, kids’ books would sell five to ten thousand copies, tops. But Deathtrap Dungeon sold 400,000 copies by the turn of 1985. It became a phenomenon. But it didn’t really make the news as a phenomenon. Because children were enjoying it, and it was a game, do you think? Yes. All of the above. 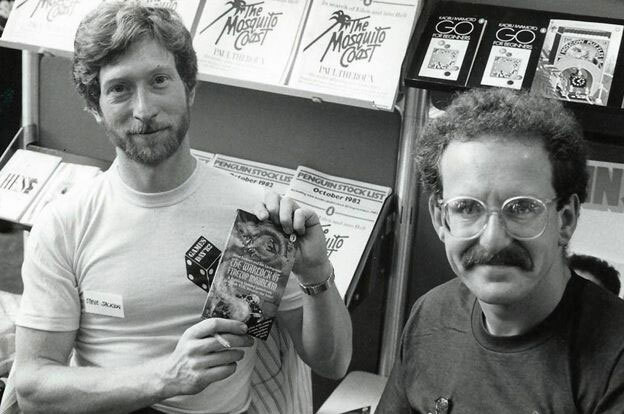 People presumed Fighting Fantasy to be a trivial fad because it was a gamebook rather than a book. Was it a challenge to write those early books? Did you and Steve know what you were doing? We were a lot younger then, so we could do a lot more. I’m talking about working 12 hours a day now; it was a lot more back then. We were running Games Workshop during the day; going home; writing Fighting Fantasy books until 2am or sometimes 3am; three or four hours sleep; and then back in to Workshop. Steve and I were figuring it all out as we went along. It’s impossible to write an interactive book entirely together, so we split it in two. I wrote the first half of The Warlock of Firetop Mountain, up to the river. Then Steve wrote the river and beyond, including the maze that drove everyone absolutely crazy. Penguin felt that the two styles were too different to work as one narrative, so Steve volunteered to edit and format the whole story into a consistent narrative, and that’s how it came out. Books two and three were easier to write as we had an agreed format and games system. From the past of Fighting Fantasy to its future. Are there any plans? There is certainly a lot of excitement around the relaunch. Scholastic are the largest children’s book publisher in the world. I’ve been made aware of the advance orders, which are quite significant, which is great for a franchise that is, after all, 35 years old. Scholastic have clearly aimed the books at a new generation. Vivid, cel-shaded, stylish covers. Not what the 40-year-old fans were expecting, but I’m delighted that they seem to like them very much. And the children certainly like them. There’s a collector’s hardback edition of The Port of Peril, with an incredible cover by Iain McCaig, who is, for me, the best Fighting Fantasy artist that’s ever been. He painted the iconic covers of The Forest of Doom, Deathtrap Dungeon, Island of the Lizard King and City of Thieves, and they were just amazing paintings. He also went on to create Darth Maul for George Lucas. I always thought Darth Maul looked a bit like Zanbar Bone, the baddie Iain painted for the cover of City of Thieves! There’s the Freeway Fighter comic that came out. There are all the apps and computer games, including Fighting Fantasy Legends by Nomad Games. There’s even talk about movies and extended TV series given the current success of Game of Thrones. I was in China recently to discuss whether Deathtrap Dungeon could be turned into VR, AR, linear film, interactive film, an extended TV series, whatever. Fighting Fantasy offers an established and much-loved fantasy world, together with a historic fan base. That’s not insignificant. Would you ever write another Fighting Fantasy book? You know that you will? I know that I will. There’s one that Steve and I kind of committed to do, which is to write something to do with Firetop Mountain for the 40th anniversary. And I think I’ve got another book in me, set purely in Port Blacksand. There’s a huge map of Port Blacksand, and only a fraction of it has been explored. I think we’re going to see a lot more happening inside it.